The commonest sites for osteoarticular tuberculosis are the spine, knee, hip, ankle and tarsus. Peripheral (non-spinal) presentation is typically a chronic, slowly progressive painful monoarthritis, often without systemic symptoms. In the hip the lesion may begin in the acetabulum, or in the head or neck of femur, or even in the synovium. The photograph shows an unidentified child who has apparent shortening of the right leg and needs assistance to stand. 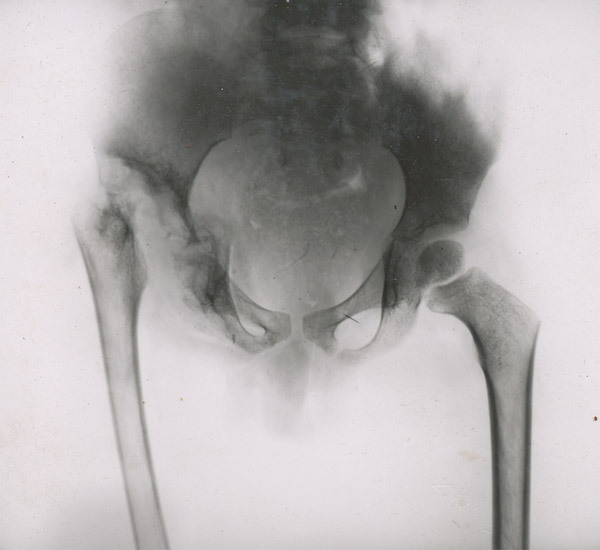 His X-ray shows destruction of the right femoral head and acetabulum. This is advanced disease. Earlier x-ray findings might show only osteopaenia and widening of the joint space.